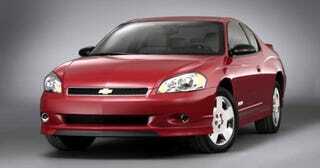 Chevrolet Monte Carlo to Go Ugly into that Good Night? And so it goes. That two-door Chevrolet known for offending aesthetes from Maine to El Segundo, while retaining enough awkward Nascar appeal to stay afloat, is going the way of the Aztecs. According to a member of GM Inside News, Monte Carlo production will end on June 20, 2007. It's leaving this earth to make way for the new Malibu and Camaro. Uglier than a monkfish in liederhosen lederhosen, the Monte Carlo truly won't be missed around these parts. And we wouldn't be a bit surprised if GM's fortunes turned around now that it's lost that albatross.